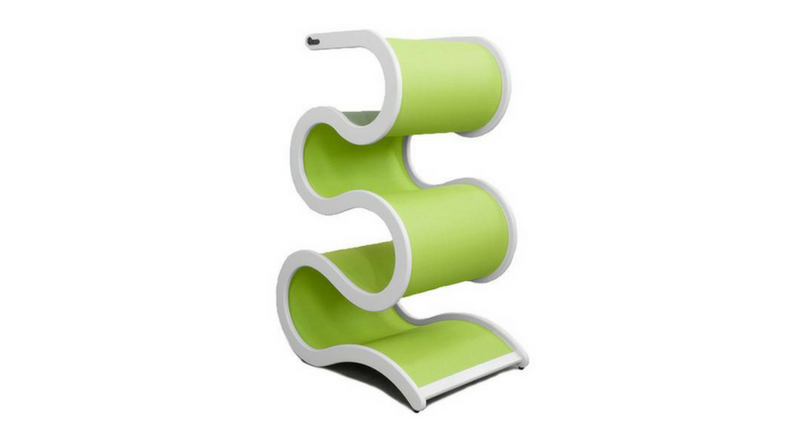 The CurvyNest by Catswall is one of the coolest looking pieces of cat furniture we’ve seen. 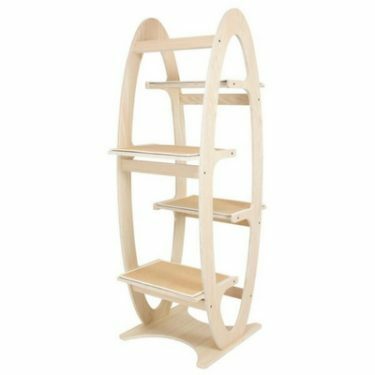 The CurvyNest is a mid-height cat tree that’s a great fit for multi-cat households. 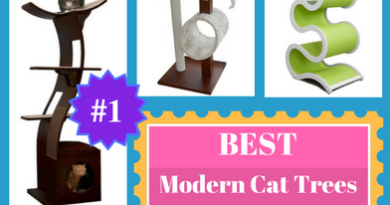 Quality craftsmanship and aesthetic flare make this cat tree a top pick. But you’ll have to be willing to pay top dollar, as the CurvyNest is the most expensive cat tree we’ve come across. 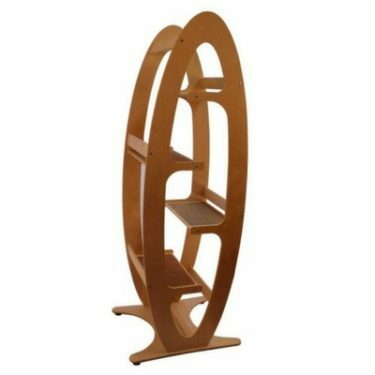 The CurvyNest has been on the market for several years but only recently became available in the USA. It is manufactured in Taiwan and it is currently distributed locally at ShopMeoow.com. You may have to wait a few weeks for it to arrive. The CurvyNest comes in 2 sizes, Small and Large. 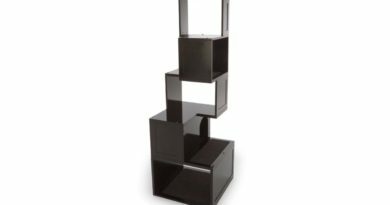 The Large CurvyNest stands 39” tall and has 4 cubbies and a top perch for lounging. 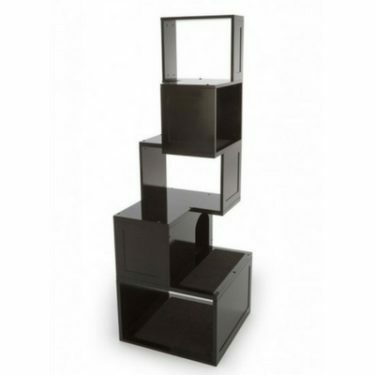 The Small CurvyNest stands 22” tall and has 2 cubbies and a top perch. This cat tree is made of painted MDF and PVC woven fabric. It comes in 3 color options: White/Orange, White/Green, and Brown/Dark Tan. No assembly required! 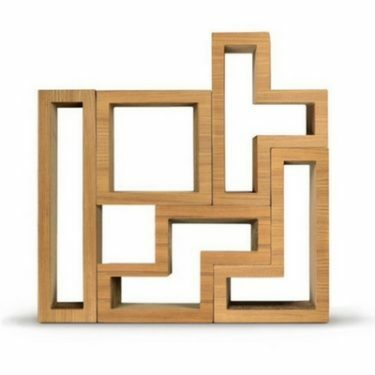 The CurvyNest is shipped as a single piece and does not have any removable or replaceable parts. 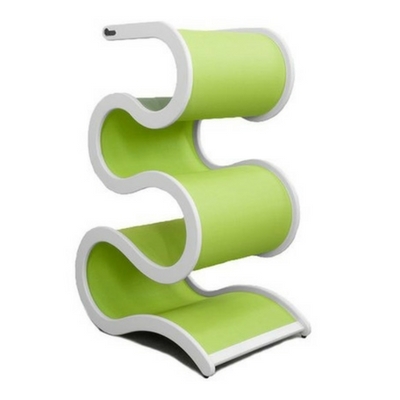 The CurvyNest is a very modern cat tree that isn’t meant to blend in with its surroundings. This eye-catching piece of furniture looks more like art than a cat tree. The green and orange color options are bold and fun, whereas the brown option is much more versatile. The CurvyNest is an excellent cat tree for multi-cat households. Each of the cubbies is adequately sized for a single cat to lounge on. 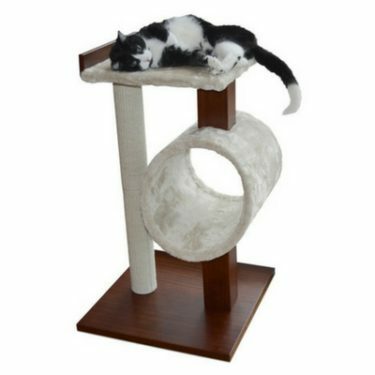 The flexible material gives the cat tree a little bit of bounce, but enough stability to withstand 4 cats jumping on it at a time. The woven fabric adds enough texture to make the surfaces easy for cats to grip, but not ideal for scratching. The non-tapered ribbon-like shape of the cat tree isn’t really designed for climbing. 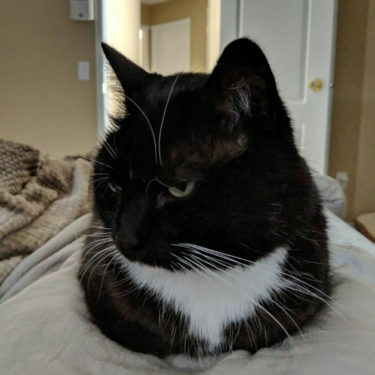 In order for cats to reach the cubbies they will need to jump directly to each level. 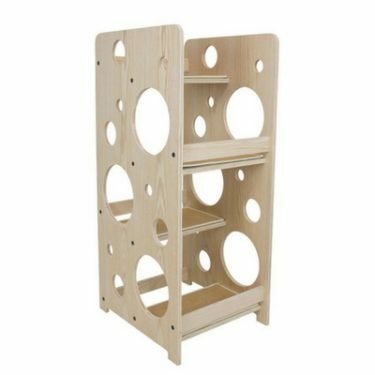 At 39” tall for the Large CurvyNest, the top perch of this medium-height cat tree is easily accessible for most cats. 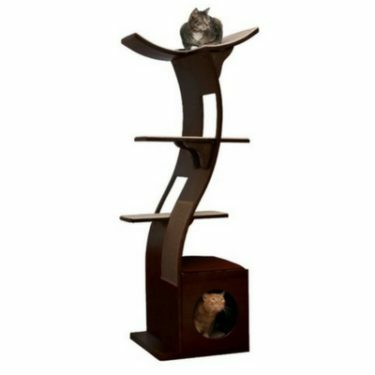 While the CurvyNest doesn’t have as much functionality as other cat trees on the market, it succeeds as a multi-cat lounger that’s fun for cats to play on too. The curved cubbies are perfectly shaped to cradle cats. They are enclosed enough to make your cat feel safe, but open enough for them to have good visibility of the room. The CurvyNest has the look and feel of high-quality furniture. 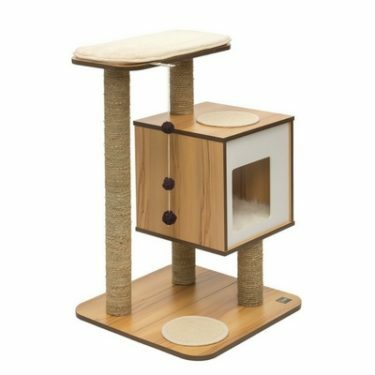 Since this cat condo doesn’t have any components that will wear out easily like carpet or scratching posts, it should last a very long time. The woven fabric is extremely durable. Rubber feet on the base improve stability and ensure the cat tree won’t slip around on hard floor surfaces. 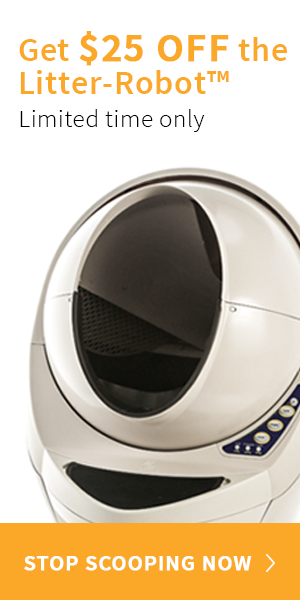 The Large CurvyNest is priced at $569 and the Small CurvyNest is $449. The CurvyNest is the most expensive cat tree we’ve come across. 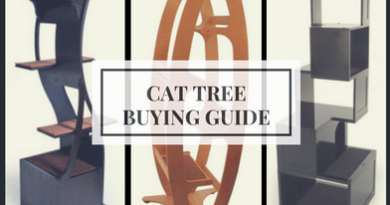 This cat tree is priced more in line with high-end modern furniture, like something from Scan Design. So is it worth the price? As a stand-alone cat tree, probably not. But as a designer piece of artwork that your cats will enjoy, the price is a bit more justifiable. Our single biggest complaint with the CurvyNest is the extremely high price. At over $200 more than the next priciest cat tree, we think Catswall is missing out on a good portion of the cat tree market. 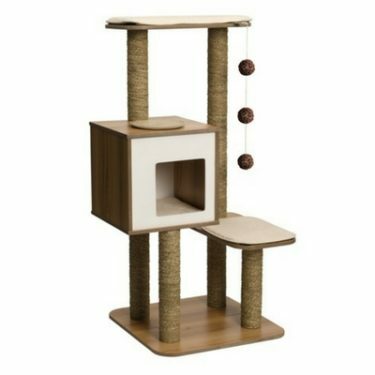 As far as functionality, we’d like to see Catswall make a taller version of this cat tree with a more tapered design that’d be easier for climbing. Adding colored woven sisal fabric to some of the surfaces would make this cat tree more cat-friendly without detracting too much from the appearance.